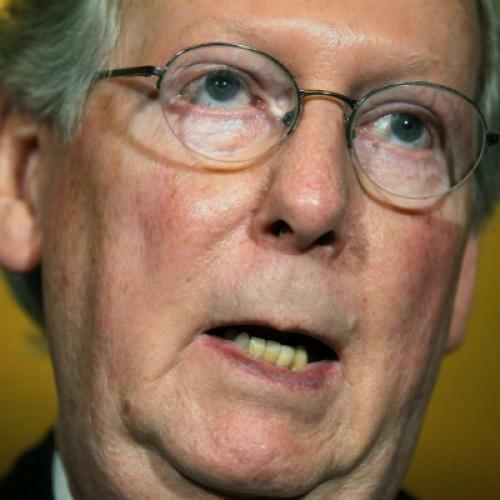 Senate Minority Leader Mitch McConnell has a habit of rushing to court to reverse his political defeats. The ink wasn’t dry on the McCain-Feingold Bipartisan Campaign Reform Act when McConnell filed a lawsuit challenging its constitutionality in court in 2002. McConnell and Senate Republicans supported similar suits challenging the Affordable Care Act moments after President Obama signed it. And now McConnell is at it again. Along with 41 Republican Senators, McConnell has filed a lawsuit, which the U.S. Court of Appeals in DC heard on Wednesday, arguing that the President usurped the Senate’s constitutional powers with his recess appointment in January of three members to the National Labor Relations Board. (The appointments are also being challenged in a separate federal case in Chicago.) As it turns out, McConnell’s constitutional arguments in this case aren’t entirely frivolous, but the courts should clearly stay out of what is a quintessentially political dispute between the president and Congress. The constitutional dispute centers around the meaning of the recess appointments clause of the Constitution, in Article II, Section 2, which says: “The President shall have power to fill up all Vacancies that may happen during the Recess of the Senate, by granting Commissions which shall expire at the End of their next Session.” As Joe Hack, a law student at George Washington University, has argued in a comprehensive history of the dispute over recess appointments, the original meaning of this provision is pretty clear: in the early Republic, at a time when travel took forever and farming members of Congress needed lots of time off to tend to their crops, Congressional recesses could last up to nine months. In order to keep the government running, the framers wanted to allow the president a chance to fill vacancies during the long periods when Congress was out of session. Acting on the assumption that recess appointments weren’t allowed unless the Senate was in recess for more than two or three days, senators from both parties began, in 2007, to convene “pro forma sessions” in order to prevent the president from making recess appointments during Senate recesses. The practice, which can last no more than thirty seconds and can involve nothing more than a ceremonial gaveling in and out of session, was started by Senate Majority leader Harry Reid. President George W. Bush respected this congressional ruse and didn’t make any recess appointments after 2007, when the Senate began to break up its recesses with pro forma sessions. But in December 2011, after Senate Republicans wrote to Speaker John Boehner asking the House of Representatives not to adjourn “to stop controversial recess appointments by the Obama administration,” the Senate held pro forma sessions every fourth day between December 17, 2011 and January 23, 2012. Despite this effort to break up the holiday recess period, President Obama announced on January 4, 2012 that he had made four recess appointments--the three appointees to the National Labor Relations Board and one, Richard Cordray, to direct the newly created Consumer Financial Protection Bureau. According to Obama, the Senate’s refusal to hold hearings for his nominees was “inexcusable. It’s wrong. And I refuse to take no for an answer.” Rejecting the constitutional validity of the pro forma sessions, on the grounds that the Senate wasn’t available to conduct real business, Obama insisted that the Senate was in continuous recess in December and January and that his recess appointments were valid. Who has the better constitutional argument, Obama or the Senate Republicans? There are decent arguments on both sides. On the one hand, Obama’s Office of Legal Counsel concluded that the president “has discretion to conclude that the Senate is unavailable to perform its advise-and-consent function.” Since the pro forma resolutions said that no business would be conducted, the argument goes, Obama could legitimately conclude that a thirty second session wasn’t enough for the Senate to do meaningful business, such as consider his nominees. Griffith’s comments are consistent with Supreme Court case law, which instructs courts to stay out of “political questions,” which the Court has defined as cases where there is a "textually demonstrable constitutional commitment of the issue to a coordinate political department”; and the "impossibility for a court's independent resolution without expressing a lack of respect for a coordinate branch of the government." Given that the president insists that the Constitution gives the president sole power over recess appointments and Congress counters that the Constitution allows Congress alone to determine what constitutes a legislative proceeding, this would seem to be a textbook case of a clash between the president and Congress that can only be resolved by a judicial decision that sides with one coordinate branch of government over the other. That’s exactly what the “political question” doctrine is supposed to avoid, which is why the appellate courts should punt this case back to Congress. As Beth Brinkman argued for the Justice Department, if Congress really thinks the recess appointments are unconstitutional, it can always refuse to pay their salaries. Of course, the fact that courts should stay out of this dispute doesn't mean that they will. Bush v. Gore was also a quintessential example of a political question the Supreme Court should have avoided but, as Justice Stephen Breyer argued in his dissent, that didn't stop the conservative majority. Still, Chief Justice John Roberts has been more sensitive to keeping the Court out of the political thicket, as the Court showed by refusing to intervene in an electoral dispute in Ohio days before the presidential election. Given the dangers of siding with one branch of government over another, here's hoping the appellate court does the right thing in the recess appointment case and the Supreme Court stays out of it as well. Although judicial punting may frustrate Republicans who want judges to reverse their political defeats, it would represent a form of poetic as well as constitutional justice. For decades, Republicans lectured Democrats about the evils of using courts to reverse their political defeats. Now that Republicans have become addicted to the practice, it’s time for courts to say enough is enough. Rather than running to court like schoolchildren complaining to the homeroom teacher, the president and Congress should resolve this quintessentially political dispute on their own.